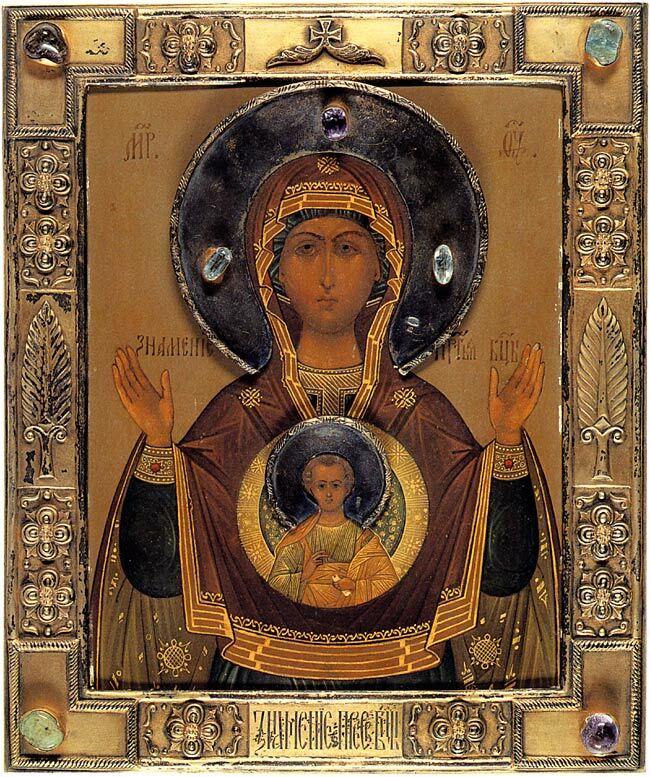 In Russia the icon of Our Lady of the Sign is called "Znamenskaya". The icon shows Mary, the Mother of God with her arms outstretched in an attitude of prayer. This position of prayer is called Orans and the image of the Mother of God in this position is sometimes called the "Oranta". In her breast is a circular medallion with the Christ child blessing the world. The icon originated in Byzantium and was considered a talisman of the Imperial throne there and in Russia. Left: The Church of Our Lady of the Sign in Tsarskoe Selo. This icon is closely associated with Tsarskoe Selo and the Romanov family. One of the earliest churches in the town was dedicated to this icon and it is located very close to the Catherine Palace. The church had a huge, silver-covered ikon of this ikon that was a popular place for prayer. Alexandra and her daughters would come here frequently to ask for the intercessionary prayers of the Virgin and light candles before the icon. The icon was brought to the Alexander Palace for special services, frequently when the Tsarevich was sick. At Makarov's order, packing was begun very discreetly, so as not to suggest to the soldiers that there was any idea of departure. As August 12th was the Grand Duke Alexei's thirteenth birthday, a Te Deum was sung before the ikon of "Our Lady of Znamenie," which was specially brought to the Palace. Prayers for the success of the journey were added to the usual ones. The Emperor and Empress took leave of all the servants who were not going with them, and thanked them for their faithful service. The Empress sorted out her dresses, and sent parcels of them to humble friends and Polish refugees, who were living at Tsarskoe Selo. The departure was fixed for the night of August 13th, but owing to some mistake on the part of the authorities it was delayed for hours. There were not enough men to move the luggage, which was to be taken at the last moment, and in the meantime the soldiers had got wind of the departure, and held meetings in all the barracks to discuss whether or not it should be allowed. The Emperor and Empress waited patiently for many hours till they were told they could leave. No one knew yet where they were being taken, and they only heard their actual destination when they were in the train. On the 30th of July, the birthday of the Tsarevich, we went to Mass, and at 2 o'clock in the afternoon a holy ikon, which was greatly venerated, was brought from the Church of Our Lady of the Sign (A feast of purely Russian origin. ), which is next to the Lyceum. It was brought in procession and the clergy of this church were admitted to the Palace and to the Chapel. The Te Deum was sung and prayers were said asking God for a prosperous journey for their Majesties, their children and all those who accompanied them. The scene was moving. The ceremony was as poignant as could be: all were in tears. The soldiers themselves seemed touched, and approached the holy ikon to kiss it. They followed the procession as far as the balcony, and saw it disappear through the Park. It was as if the past were taking leave, never to come back. The memory of this ceremony will always remain in my mind, and I cannot think of it without profound emotion. In the course of the day we all went, as usual, to the kitchen-garden, and groups were taken. Alexandra had a special icon of the Znamenskaya which she placed in her private bedroom chapel. 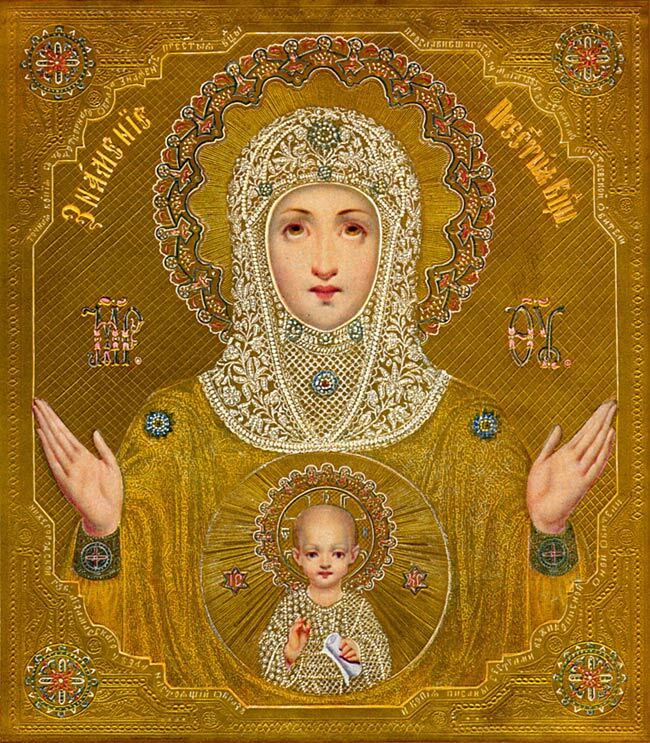 This icon always traveled with her and the Empress took it with her into exile in Siberia. It was found in Yekaterinberg stripped of it's jeweled cover (if anyone knows what became of ths ikon I would like to know!). The grandduchesses had identical copies of the ikon in Siberia, which were also found by the Whites after the Bolsheviks withdrew from Yekaterinburg. Copies of the ikon hung in many of the rooms of the Alexander Palace and in the rooms of Marie and Anastasia's hospital in the Feodorovski Village (Gorodok). These versions wore distinctive white cowls. Above: This ikon was on the wall behind the Imperial bed. It hung at the top on the right-hand side near the entrance to Alexandra's small chapel. It was presented to the Imperial family around 1910. This ikon shows "Our Lady of the Sign" in the center, surrounded by images of the Imperial family's heavenly protectors. The ornate silver setting is by the Moscow firm of Olovianishnikov. This icon stayed in the Empress's bedroom until 1941. After the war it was sent to the central depot in the Alexander Palace, where all of the returning treasures of Tsarskoe Selo and Pavlovsk were stored. In 1956 many of the treasures of the Alexander Palace were divided up and sent to other museums. 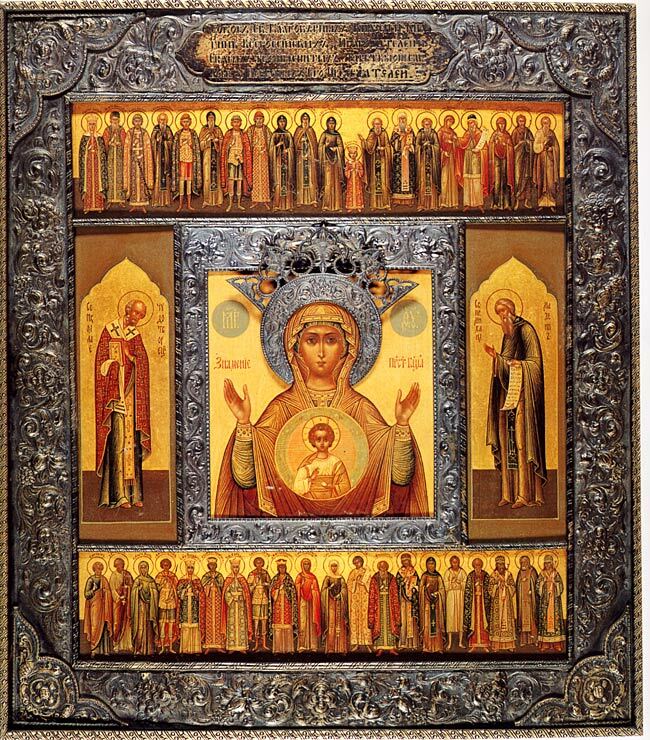 This icon went to the Hermitage, where it is today. 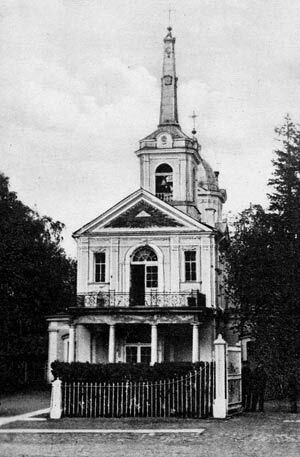 In the last days of 1916 the Empress with Olga, Tatiana, and General Racine paid a brief visit to Novgorod to inspect military hospitals and to pray in the monastery and church of Sofivsky Sobor, one of the oldest churches in Russia. Her visit was opposed, quite senselessly, by St. Petersburg society, which accused her of going for some bad purpose, God knows what. But at Novgorod the people poured out in throngs to greet her with peals of bells, music, and cheers. Before leaving the city the Empress paid a visit to a very old woman who had spent forty helpless years in bed, still wearing the heavy chains of penitence which as a pilgrim she had, almost a lifetime before, assumed. As her Majesty entered the old woman's cell a feeble voice uttered these words: "Here comes the martyred Empress, Alexandra Feodorovna." What could this aged and bedridden recluse have known or guessed of events which were to come? Below: The ikon of our Lady of the Sign below was reproduced in books and prints. This image was printed in the last years of the dynasty. It shows a very sentimentalized version of the icon, encrusted in gold, with a jeweled veil. This is a loose replica of the celebrated icon in the Tsarskoe Church.